Coming off her first #1 on my chart, “Goodbye To You”, Branch took a fast ride up on this Santana single that served as the lead single from Shaman. Several weeks later, it would arrive at #1 and stay there through mid-December, when “Beautiful” by Christina Aguilera took its place. The two acts would team up again on 2005’s “I’m Feelin’ You”, Branch being a part of The Wreckers, which went to #3. This trio from Córdoba, Spain got a lot of people up and dancing in 2002 with their novelty dance hit. There were a fair amount of people who thought this might be the next “Macarena” as it did extremely well internationally, but that didn’t translate into a U.S. hit despite some airplay in big markets. It would go to #1 on my chart in November and was kicked out by the Santana and Michelle Branch duet. After the Backstreet Boys took a hiatus at the end of 2001 following a single “Drowning” (a #1 on my chart) and their greatest hits collection The Hits: Chapter One, Carter was the first member to go solo. His Now Or Never album may have been certified Gold, but it’s not well-remembered; nor is this single, which received little airplay at CHR radio. Carter released another album in 2011 called I’m Taking Off. They were huge in Ireland and in the United Kingdom, but RCA Records couldn’t break them in a bigger way here. Their biggest single to date here was 2000’s “Swear It Again”, a moderate radio single with better physical sales. This, however, didn’t muster up as much airplay and virtually no sales at all. The quintet turned quartet managed to stay together through last year, when they finally announced a split. Before he was Robin Thicke, he simply used his last name on his first album, Cherry Blue Skies (renamed as A Beautiful World.) Sampling the #1 “A Fifth Of Beethoven” by Walter Murphy & The Big Apple Band, a disco take on a segment of Beethoven‘s Fifth Symphony, the record never took off in the U.S., but with a hit like “Blurred Lines” earlier this year, he’ll never be alone without a few bucks. These Canadian rockers had been around for almost a decade prior to this single; however, this was their only release to see any sort of significant crossover airplay in the States. Thus, this was my introduction to them, and the epic sound of their alternative and pop hit took a journey up to #2 before slowly making its way out of the top ten. The band last put out an album, Curve, in the spring of 2012. In 2002, *NSYNC took an urban direction by including Nelly on a remix of their last single ever, “Girlfriend”. This also influenced Timberlake on his first solo record later that year, Justified. After a high debut and a quick rise to #2, “Like” was surpassed by a few other hot singles, and his never regained the momentum to go to #1. However, his followup release, “Cry Me A River”, would spend a week there. This former #1 single from Bedingfield featured a sped-up vocal and a pulsating rhythm. It was different from anything else on the airwaves at the time and due to this, it was a hit at CHR radio as well. In 2003, he made it to the runner-up spot with “If You’re Not The One” and then to #11 in 2005 with “Wrap My Words Around You”. He appeared as a judge on The X Factor in New Zealand earlier this year. In 2002, we decided that inserting an extra letter “R” into words that didn’t need them was the hip thing to do, as evidenced by the #1 “Hot In Herre” by Nelly and then this single by a sexed-up Aguilera, whose clothing like her album title was Stripped. Alas, “Dirrty” had to settle in the #2 spot for a few weeks before flying down the chart. It was too shocking of an image change to get a widespread approval. If you loved that pop-punk realness that Lavigne was serving, then you were one of many back in 2002 digging her album Let Go. 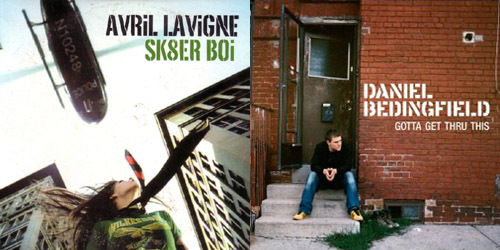 “Complicated” went to #1 a few months prior, so “Boi” became her second to pull off the rick despite its AOL speak which automatically dates it. I never was a skater boy (can I make it any more obvious?) but I was a fan of Rocket Power back then and that’s enough, right? Lavigne maintains a smaller presence on my chart, last making it on earlier this year with “Here’s To Never Growing Up” (#13). Just like three of her previous hits, Adele is bonded to the top. The singer’s fourth #1 single on my chart, “Skyfall”, has been at the top of the pops for three weeks running. However, just as the movie is descending down the Box Office chart, so will the song from my own list. Nevertheless, it’s great to see a song from a film be so successful on my chart when many others have underperformed in the past. In fact, this is the #1 single specifically written for a movie to top my chart since Chad Kroeger and Josey Scott’s “Hero” from 2002’s Spider Man. It spent five weeks there. Knockin’ on the door to the top is fun., who are having no fun sitting it out at #2 with “Carry On”. They want their third #1 single in a row, but it ain’t happening this week. Behind them are One Direction, dropping to #3 with “Live While We’re Young”, while former #1’s for Andy Grammer (“Miss Me”) and The Script/will.i.am (“Hall Of Fame”) hold down the #4 and #5 spots, respectively. Robbie Williams has his biggest solo hit on my chart as “Candy” advances 8-6. It’s still in the top ten in the United Kingdom as well. Pink also takes a big leap from 12-7 with “Try”. Parent album The Truth About Love has been discounted at a number of outlets holding Black Friday sales. We’ll have to see if the price cuts pay off on the album chart this week. Jason Mraz also scores his first top ten hit since 2008’s “Make It Mine” as “93 Million Miles” climbs to #10. It’s the singer’s sixth song to make the top ten. This week’s Biggest Mover belongs to Rob Thomas and the boys of Matchbox Twenty, who rocket from 29-19, a gain of ten notches, for “Overjoyed”. The title was formerly a top thirty hit on the Hot 100 back in 1986 for Stevie Wonder. Two songs with “over” in the title have made it to #1 on my chart. In 2000, Christina Aguilera did it with “Come On Over Baby (All I Want Is You)”, and in 2003, Sixpence None The Richer hit the top with their remake of Crowded House’s “Don’t Dream It’s Over”. Other big movers on the countdown this week include The Script’s “Six Degrees Of Separation” (27-19) and Hunter Hayes’s “Wanted” (27-21). One Direction scores this week’s highest debut with “Little Things”, a recent #1 in the United Kingdom which was co-written by Ed Sheeran. It enters at #34. It’s currently gaining big on radio here in the United States. Will a change in tempo give the boy band their biggest hit yet? We shall see in the new year. Kylie Minogue debuts at #39 with the Abbey Road Sessions version of “On A Night Like This”. The original went to #1 in Australia in 2000. This version gets a release in the United Kingdom on December 17. Lastly, Matt Cardle debuts at #40 with “Anyone Else”. It’s his second single from The Fire. “It’s Only Love”, the first single, just peaked at #20 recently. Those Christmas songs are on the move, but nevertheless, new ones from Of Monsters And Men and Rebecca Ferguson are added on this week, plus, the song that could become Cher’s first top-40 hit on my chart in almost thirteen years. Keep an eye on it. See my full chart and commentary on the M4BCC message board.